Is there a more iconic American muscle car than the Ford Mustang? Where not sure there is. In fact, we reckon that the Ford Mustang may well be one of, if not the most celebrated automobile ever to come out of the land of the free. Designed by Gale Halderman, the first generation Pony Car was unleashed upon the automotive world in March of 1964 and stayed in production until June of 1973. Customers could choose to have their ‘Stang in three different body styles; a two-door hardtop, a two-door fastback or a two-door convertible. Power was derived from a simply vast array of inline six-cylinder and V8 motors which varied in sizes of displacement and levels of power, depending on the particular model and the customers preference. The shove from these engines was sent to the Mustang’s rear wheels via either a three or four-speed manual or three-speed automatic transmission. 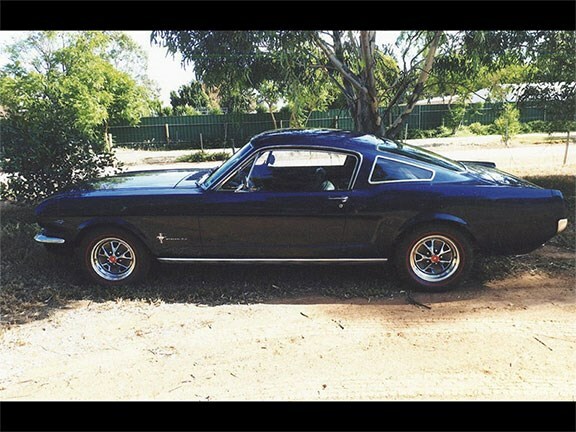 This particular Mustang is a ’65 model fastback and comes equipped with a recently rebuilt 289ci (4.7lt) Windsor V8. According to the seller, the Mustang has had an extensive bare-metal restoration and has only travelled approximately 4500 miles since. The seller adds that the ‘Stang comes equipped with GT driving lights and Shelby rear windows. The Mustang is $55,000 and anyone interested in this American classic can view the full listing here. Thumping V8 and Simmons… what’s not to love?